The slow death of Dopplr was a sad thing to read. Whatever the reasons behind it, the atrophy of such an elegantly designed and executed idea is a cheerless thing to behold. But unfortunately it's symptomatic of something of a pattern (MySpace, Bebo, Friends Reunited). It's no accident that strong design thinking played such a part in Dopplr's early attractiveness. One of the founders once said that designing Dopplr was like 'sculpting with data'. It's the kind of approach that can seem anathema to some large incumbent businesses that favour the inductive thinking (based on directly observable facts) and deductive thinking (logic and analysis, typically based on past evidence) championed by business schools over the abductive thinking (imagining what could be possible) emphasised in design (a HT to AG Lafley for that one). Put simply, established businesses get very good at driving incremental gain through incremental efficiencies, a cycle characterised by traditional thinking that is typically convergent - focused on making choices, closing down opportunities, converging on a solution and then implementing it. The problem with this, as Tom Hulme from IDEO points out in this HackFwd talk, is that it is an inherently uncreative process. The alternative is is to expend energy on divergent thinking. Rather than making choices all the time, you spend time creating choices. As many good choices and new options as possible. Design thinking is a human-centred approach that puts customer insight and feedback at the heart of everything, and defines the problem through observation (what people really do and want as opposed to what you are told that they do and want), cross-functional insight, immersion, empathy, relentless questioning (of the brief, of the assumptions, of the filters the business typically uses), and involves design thinkers at the earliest possible stage in order to bring an understanding of culture and context (before you even get to the ideas) to help define the right problem in a way that invites creative solutions. And no judgements. At least not early on. Because you want people to really participate, and be motivated, not guarded, or fearful of failure. Pixar (a company that any business that aspires to be creative in any way can learn a lot from) has a culture that doesn't judge ideas, but 'plusses' them - taking someone else's idea as a start point from which to build - looking forwards, not back. And no Eureka Myths, or belief in lone creative geniuses, or the lightening strike of inspiration. The core skill of innovators is error recovery, not failure avoidance. It's hard graft. It's rapid experimentation and prototyping. Prototyping that is only as complex, time-consuming and expensive as it needs to be to get useful feedback and evolve an idea - agile requirements are barely sufficient. The more time spent perfecting a prototype the less open its creators are to changing it through feedback. Good ideas that show promise are given room to breathe and grow, far away from limited thinking ("Yes, but…"). Stages in the process are looped, repeated. Just as analytical thinking seeks to deconstruct into constituent elements to understand, so design thinking recombines, builds and iterates to understand. And finally, design thinking dictates that you budget to the pace of innovation, not innovate to the cycle of your budget. It's nonsense to let inflexible, clunky (and often artificially generated) business cycles get in the way of the next innovation that might just save your business a couple of years from now. It's very easy to talk about being 'Always in Beta'. Far less easy to understand what that really means for the kind of processes and practices that are deeply embedded in many established businesses, and how to change them. As the world around us becomes increasingly digitised, products become services, and services become experiences, the old ways don't cut it anymore. 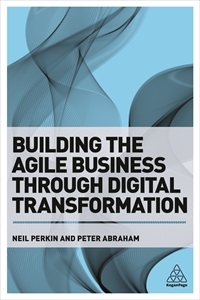 Being agile is not about velocity, it is about responsiveness. Responding to the changing needs of customers who too often get there first. There's no point spending a year crafting a perfect product only to find that when you launch it, your market has moved on. Business needs to move at the speed of culture. Design is often seen in terms of an end-result, but it is the process of design that offers a protocol for staying close to the needs of your customers, and for finding new opportunities. In the parlance of IDEO: don't make a product, solve a problem.